Ok, the past is back. I know that the passion for the old forms of Metal is a trend today, and some works are really good. But, on other ones, not as good, as the bands wanted them to be (or are they thinking that copying the works of others has a bit of merit?). 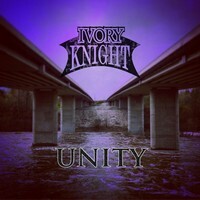 Bands as IVORY NIGHT have their talent, as “Unity” is here to proove. But they must evolve into a better form. There are moments when their music reminds us of something from US Metal (remembering: that mix of weight, aggressiveness and melodies that names as THE RODS and OMEN showed), on some others are as aggressive as TESTAMENT (with the same melodic notion), but always with a strong personality and tons of energy flowing into our ears, and a good technical level in each musical instrument. Their music is really great, with very good and charming choruses. The only sin we can input on “Unit” is the sound quality. These instrumental tunes are not the best for their work (the drums are sounding pretty strange in some moments), and sometimes, the lack of weight is evident (the guitars try to compensate it, but we still can feel it), along with some parts where the instruments entangle in a sound chaos. I believe that the producer tried to put some aggressiveness into their music, or was searching for something more organic, but this form of music demands a clean and powerful production. Taking all these negative features of the production out, “Unit” shows a good band, indeed. On nine songs, they show a pretty good work, and the aggressive power of the guitars on “Rejected”, the Hard’n’Heavy scent that fills “A Million Miles Away” with its good vocals (it’s strange, but some AOR elements appears here on the chorus), the raw energy that comes from the musical arrangements of “Fight”, the excellent and catchy tempos shown on “Conman”, and the very good melodies of “Waiting for Tomorrow” (with good vocals that can be better in some tunes) can be said as their best moments. But they need to improve as well, because their talent is evident. They are a good name for now, but IVORY KNIGHT can do better.